Effigy (portrait, human head, or whole figure) ceramic art (usually male) has been featured in all sorts of wares since ancient times from throughout the world. In many instances it is associated primarily with funeral rites, but often it is pure decoration on functional wares like this interesting piece. 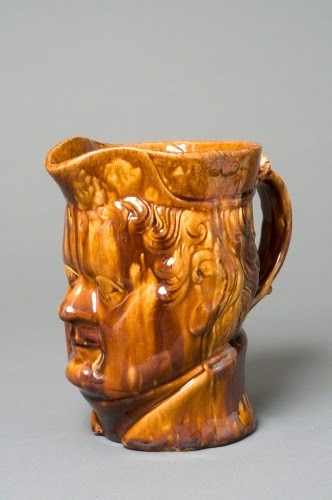 Mugs and pitchers of this sort became fashionable in England in the 1700s, and the interest transferred to the US during the mid- to late 1800s. The Royal Doulton company in England has been the most recognizable source of these “character” or “Toby” vessels. The English examples are usually pseudo-comical characters, sometimes from the English music halls. They inevitably are dressed in 1700s garb. The tri-corn hat affords an easy spout on this pitcher. Interestingly, the fad caught in Japan, which exports these unusual objects to this day. 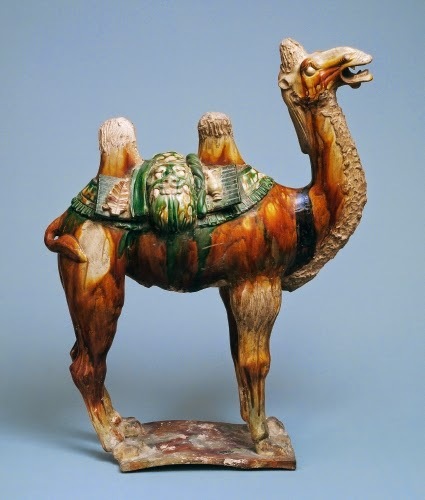 Chinese and Japanese ceramics were very popular export items to Europeans and Americans starting in the late 1700s. This pitcher imitates the three-color glazes used by Chinese ceramic artists during the Tang period (618–907 ce). The glaze was applied at the top of the vessel and allowed to run down naturally while in the kiln. An example of the Chinese glaze is below. 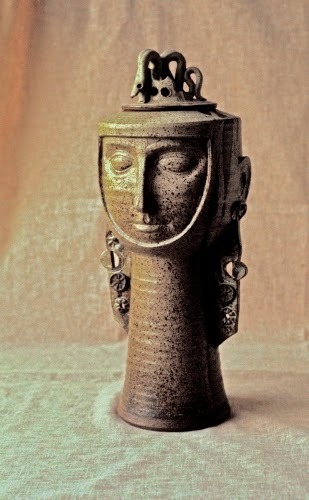 “Character” vessels originated in ancient times. The Ancient Egyptians included many effigies of the deceased in their tombs. 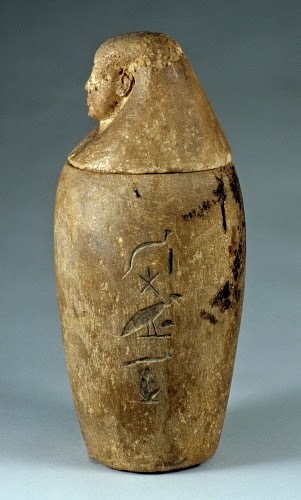 Particularly important were the canopic jars, in which they stored the internal organs of the deceased, as they believed that the deceased would need their physical body in the afterlife (hence the complicated mummification process of bodies). This jar bears the head of Imsety, Guardian of the Liver. 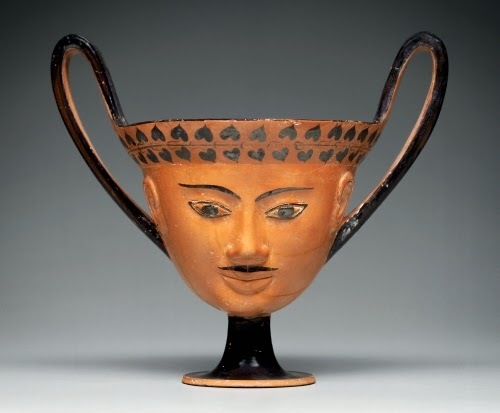 One also finds head vessels in ancient Greece. Since this is a drinking cup for wine (which the Greeks always mixed with water), I think the satyr’s face is meant to be humorous. For some reason, I find it creepy. Satyrs were half-man, half-goat beings who were thought to be promiscuous, usually because of the effects of alcohol and their affiliation with Bacchus, the god of the grape vine’s results. 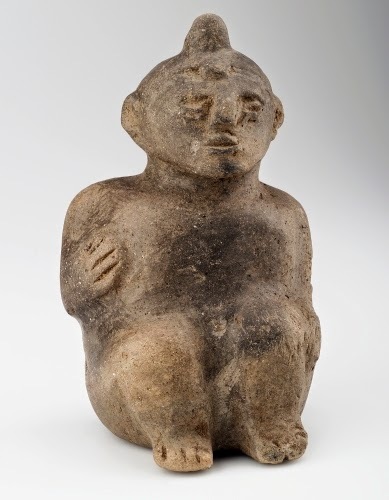 Ancient Meso- and Central American cultures are renowned for their ceramics, particularly effigy-type vessels, which included incense burners. Stirrup-spouted vessels like this were usually tomb objects containing various food needs for the deceased. The realistic rendering of the face leads art historians to believe they may have been specific portraits of the deceased, and were undoubtedly not used for everyday household tasks. Meso- and Central American cultures are also renowned for vessels decorated with animal heads. 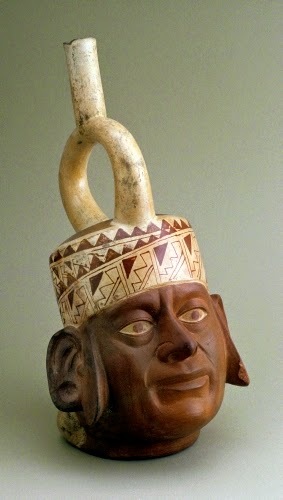 The people of the Mississippian culture that populated the regions adjacent to the Mississippi River were avid traders. They are thought to have traded with Mesoamerican cultures from Mexico. Such effigy vessels have not been found in other native cultures. They are thought to have served ritualistic purposes by being placed near deceased persons. A seated prisoner perhaps commemorated a great warrior’s accomplishments during life. During the 1850s, several African American potters rose to prominence in this important ceramic producing region of South Carolina, renowned for it grainy type of stoneware. 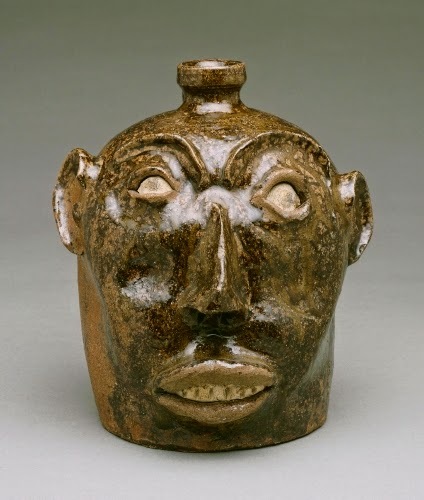 Face pottery such as this was influenced by African traditions, particularly the West African art in which the head of a work is exaggerated in size. The head was considered to house a person’s soul. Works featuring large heads, including pots along with other objects personally associated with the deceased, were often left at burials in Africa. Zeljko Kujundzic combines influences of the native North American Indian arts of the northwest coast, with the stylization and solemnity of Byzantine art from his native Yugoslavia. Unlike the other works in this post, his vessel is not a funerary object. However, it presents the same gravity as vessels left in tombs in previous periods. His works have titles typically such as “Ancestor Figure,” and “Earth Man,” as well as terms referring to Christianity. Studio activity: Make a slab built effigy pot or mug as a self-portrait. Take a lump of clay and form it into a ball or cube. Using the thumb, create an opening (hole) in what will be the top of the pot, and work the hole bigger, thinning and smoothing the interior and outside of the walls of the pot until it is the desired size and shape. Apply what you think your features resemble, not paying attention to extreme realism. Exaggeration of your features allows the pot to have more impact. Experiment with dripping glazes rather than evenly covering the vessel.